The StarCraft soundtrack helps me win. And I’m not the only one who thinks so. In 2010, shortly after StarCraft II: Wings of Liberty came out, the Idle Thumbs podcast put out an episode that discussed whether leaving StarCraft’s in-game soundtrack on can help you focus and play better. The argument in favor came from one of the podcast’s co-hosts, Chris Remo, who’s currently a game designer for Campo Santo and a composer for multiple games like Firewatch and Gone Home. Seven years later, Remo didn’t remember who had written the post in question, but he did remember that the supposed power of the StarCraft soundtrack has long been a conversation in the scene. “I remember the casting duo Tasteless and Artosis once saying you should only ever play StarCraft accompanied by the StarCraft soundtrack—never any other music,” Remo told Compete via email. There’s actually some research to back up the theory that listening to the StarCraft soundtrack could help the player focus better, particularly in the highest echelons of play. The lower-level players didn’t benefit from the in-game music or sound effects as much as the top players did, but oddly enough, they did play better when accompanied by “unrelated background music.” So, listening to some background music seems to benefit players of any level, although more experienced players did better when they also had the benefit of the in-game sound effects. Although Chris Remo couldn’t remember which StarCraft pro recommended that players listen to music, it could have been Geoff “iNcontrol” Robinson, a former StarCraft pro who competed in the Brood War days starting in 2009, and went on to compete in StarCraft II until early this year. Robinson became well-known for listening to music during his matches, either the StarCraft soundtrack or his own playlists. One notable exception to this line of thinking is Sasha “Scarlett” Hostyn, known for competing in StarCraft with no sound on at all: no music, no attack sounds, nothing. She told the New Yorker as explanation: “I don’t like anything bugging me when I’m playing.” Turning off the sound effects forces the player to focus on the game’s mini-map, since you’ll no longer have the benefit of hearing, say, the characteristic “nuclear launch detected” alert. Scarlett’s experience of perceiving sounds and music as “bugging” her doesn’t seem to line up with how most other StarCraft players feel, however. During the original Idle Thumbs episode, the hosts discussed the idea of how “split attention” can be beneficial in a high-level competitive game like StarCraft, and how leaving the soundtrack on can help with that. There’s some research to back up that theory, too, according to a study published in WORK, a journal that publishes workplace-related research. The researchers found that “background music” can help people focus more on getting work done—as long as the workers enjoy the music in question. 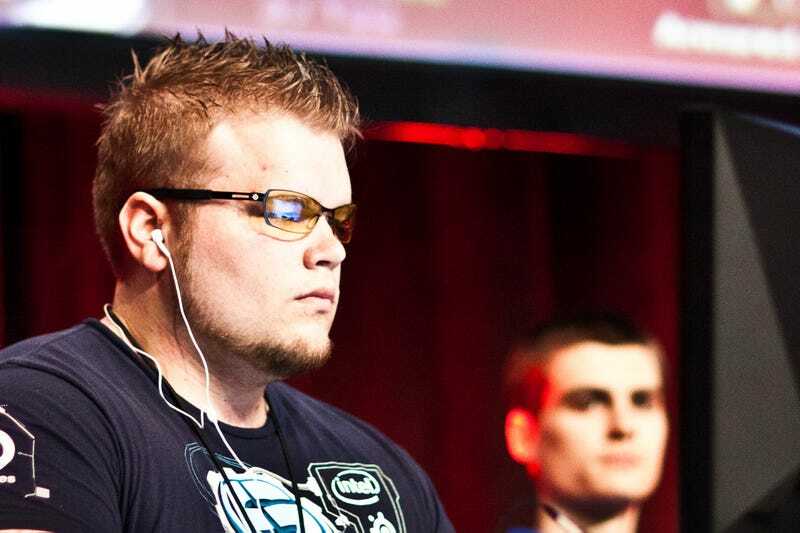 Sure, you might say StarCraft isn’t “work”—but it is for pros like Scarlett and iNcontrol. No formal studies have been conducted about StarCraft’s music, although there is an admittedly unscientific poll on the TeamLiquid forums, in which 83% of 741 respondents said that playing music “affects how well [they] play.” Unfortunately, the poll doesn’t specify whether that effect is negative or positive. I decided to perform a little experiment of my own and played six StarCraft II matches against the AI, flipping the music on and off between each match. I listened to the StarCraft II instrumentations, although the StarCraft: Brood War soundtrack has also been an in-game option since 2013. I won all three of my matches with the music on, and I lost two out of three matches without it. My music-free matches, with their long silences, made me feel more nervous and stressed. In one of my songless matches, I tried a bizarre rush build that I hadn’t done in years and, of course, I botched it. During my music-infused matches, I felt calm, as though all was right with the world of StarCraft. That said! I’m biased in favor of the music. Ever since I heard that Idle Thumbs episode back in 2010, I’ve been playing StarCraft with the StarCraft soundtrack. Seven years later, I could hardly imagine the game without it. Still, I haven’t found any proof that there’s something special about StarCraft music in particular, compared to any other songs. Until now, I’ve never listened to any other music while playing the game, the “expert” advice to leave the StarCraft soundtrack on long entrenched. So, in response to Robinson’s advice that I listen to “what I like” while playing StarCraft, I’ve made my choice: I like the StarCraft music for playing StarCraft. It might be superstitious, but it’s helping me win, and that’s exactly what I like about it.